Have a big get together coming up but don't want to bring a bland and boring dish? Want to bring something delicious and secretly healthy?! 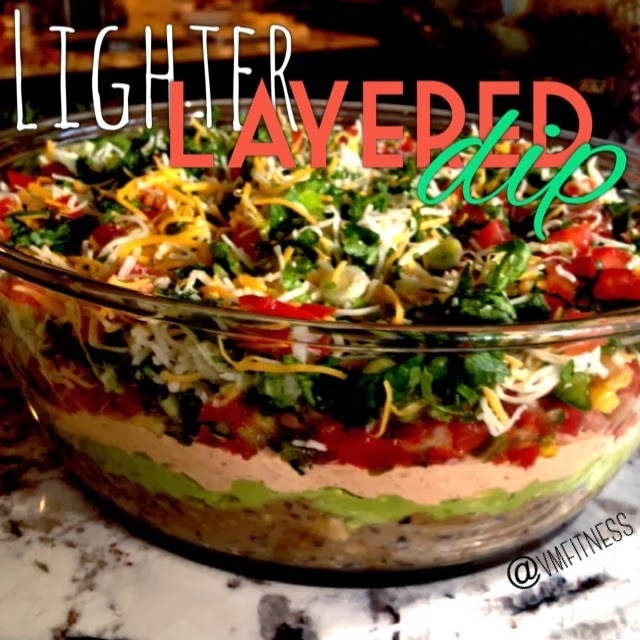 Try out this lightened up dip! I made it for this past Superbowl Sunday and it was a huge hit! Bean dip layer: 1 - 15 oz can of black beans rinsed well mashed or pureed with 1 ripe avocado. Add salt, paprika, black pepper, some lemon juice, 1/2 packet of taco seasoning, and Salsa drained juice (LAYER 4!) for taste and mixability. Guacamole layer: 2 ripe avocados mashed + 1/2 lemon squeezed and some salt and pepper to taste. Cheese and garnish: light Mexican 4 cheese or mozzarella and chopped up scallions, cilantro, and more fresh tomatoes! Get all your layers ready first, THEN start layering! This looks amazing! Thanks for sharing. Love the blog! it was very informative and midwestfitclub Personal Trainer we tend to tend to area unit happy to assist you with wise coaching job and development. I just love the way with which you describe the whole blog post. Each time i visit this blog find some new in it. This time you did a great job. I appreciate your concerns for making the people aware for maintaining healthy body.